Saint Michael, Archangel, defend us in battle. by the power of God, thrust into hell Satan and all the other evil spirits who prowl about the world seeking the ruin of souls. Amen. The Prayer to the Archangel Michael was composed by Pope Leo XIII (d. 1903) after he had a vision of the battle between the "Woman clothed with the sun" and the great dragon who tried to devour her child at birth, in the Book of Revelation 12:1-4. In 1886, the pope decreed that this prayer be said at the end of "low" Mass (not "high", or sung Masses) throughout the universal Church, along with the Salve Regina (Hail, Holy Queen); and the practice of the congregation praying these prayers at the end of Mass continued until about 1970. In 1994, during the International Year of the Family, Pope John Paul II asked all Catholics to pray this prayer daily. He warned that the fate of humanity was in great peril (in particular because of the United Nations Population Conference to be held in Cairo that year). Though he did not order that the prayer be said after Mass, he urged Catholics to pray together to overcome the forces of darkness and evil in the world. "May prayer strengthen us for the spiritual battle of which we are told in the Letter to the Ephesians: 'Draw strength from the Lord and from His mighty power' (Ephesians 6:10). It is this same battle to which The Book of Revelation [Apocalypse] refers, recalling before our eyes the image of Saint Michael the Archangel (cf. Revelation 12:7). 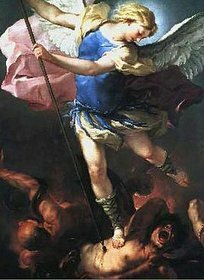 Pope Leo XIII certainly had a very vivid vision of this scene when, at the end of the last century, he introduced a special prayer to Saint Michael throughout the Church. Even if this prayer is no longer recited at the end of every Mass, I ask everyone to remember it and to recite it to obtain help in the battle against forces of darkness and against the spirit of this world". Continuing our catechesis on the Apostles, I wish to reflect today on Thomas the twin. It is most especially in John’s Gospel that we learn about Thomas. At a dangerous time in our Lord’s life, when he decided to visit Lazarus in Bethany, it was Thomas who said: "Let us also go, that we may die with him". He shows us that the most important thing is never to distance oneself from Jesus. The life of a Christian is one spent together with the Lord. At the Last Supper it is Thomas who says: "Lord, we do not know where you are going, so how can we know the way?". His question leads to the celebrated response: "I am the Way, the Truth and the Life". Jesus also proclaims these words to us today. A further episode in Thomas’ life is well known to us all: that of the ‘doubting Thomas’, who says "unless I see in his hands the print of the nails, and place my finger in the mark of the nails … I will not believe". Yet, once Jesus appears to him he utters the most splendid profession of faith in all the New Testament: "My Lord and my God!" Let us take heart from the life of Thomas: he comforts us in our uncertainty; shows us that doubt can lead to spiritual growth, and he helps us learn from Jesus the true meaning of mature faith, encouraging us to persevere as disciples of Christ! 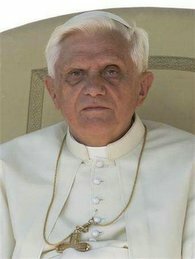 The following is the text of Pope Benedict XVI's speech to Muslim envoys, in which the pontiff tried to defuse tensions between the Catholic Church and Islam over comments he made earlier this month in southern Germany. I am pleased to welcome you to this gathering that I wanted to arrange in order to strengthen the bonds of friendship and solidarity between the Holy See and Muslim communities throughout the world. I thank Cardinal Poupard, President of the Pontifical Council for Inter-Religious Dialogue, for the words that he has just addressed to me, and I thank all of you for responding to my invitation. The circumstances which have given rise to our gathering are well known. I have already had occasion to dwell upon them in the course of the past week. In this particular context, I should like to reiterate today all the esteem and the profound respect that I have for Muslim believers, calling to mind the words of the Second Vatican Council which for the Catholic Church are the Magna Carta of Muslim-Christian dialogue: "The Church looks upon Muslims with respect. They worship the one God living and subsistent, merciful and almighty, Creator of heaven and earth, who has spoken to humanity and to whose decrees, even the hidden ones, they seek to submit themselves whole-heartedly, just as Abraham, to whom the Islamic faith readily relates itself, submitted to God" (Declaration Nostra Aetate, 3). Placing myself firmly within this perspective, I have had occasion, since the very beginning of my pontificate, to express my wish to continue establishing bridges of friendship with the adherents of all religions, showing particular appreciation for the growth of dialogue between Muslims and Christians (cf. Address to the Delegates of Other Churches and Ecclesial Communities and of Other Religious Traditions, 25 April 2005). As I underlined at Cologne last year, "Inter-religious and inter-cultural dialogue between Christians and Muslims cannot be reduced to an optional extra. "It is, in fact, a vital necessity, on which in large measure our future depends" (Meeting with Representatives of Some Muslim Communities, Cologne, 20 August 2005). In a world marked by relativism and too often excluding the transcendence and universality of reason, we are in great need of an authentic dialogue between religions and between cultures, capable of assisting us, in a spirit of fruitful co-operation, to overcome all the tensions together. Continuing, then, the work undertaken by my predecessor, Pope John Paul II, I sincerely pray that the relations of trust which have developed between Christians and Muslims over several years, will not only continue, but will develop further in a spirit of sincere and respectful dialogue, based on ever more authentic reciprocal knowledge which, with joy, recognises the religious values that we have in common and, with loyalty, respects the differences. Inter-religious and inter-cultural dialogue is a necessity for building together this world of peace and fraternity ardently desired by all people of good will. In this area, our contemporaries expect from us an eloquent witness to show all people the value of the religious dimension of life. Likewise, faithful to the teachings of their own religious traditions, Christians and Muslims must learn to work together, as indeed they already do in many common undertakings, in order to guard against all forms of intolerance and to oppose all manifestations of violence; as for us, religious authorities and political leaders, we must guide and encourage them in this direction. Indeed, "although considerable dissensions and enmities between Christians and Muslims may have arisen in the course of the centuries, the Council urges all parties that, forgetting past things, they train themselves towards sincere mutual understanding and together maintain and promote social justice and moral values as well as peace and freedom for all people" (Declaration, Nostra Aetate, 3). The lessons of the past must therefore help us to seek paths of reconciliation, in order to live with respect for the identity and freedom of each individual, with a view to fruitful co-operation in the service of all humanity. As Pope John Paul II said in his memorable speech to young people at Casablanca in Morocco: "Respect and dialogue require reciprocity in all spheres, especially in that which concerns basic freedoms, more particularly religious freedom. They favour peace and agreement between peoples" (no. 5). Dear friends, I am profoundly convinced that in the current world situation it is imperative that Christians and Muslims engage with one another in order to address the numerous challenges that present themselves to humanity, especially those concerning the defence and promotion of the dignity of the human person and of the rights ensuing from that dignity. When threats mount up against people and against peace, by recognising the central character of the human person and by working with perseverance to see that human life is always respected, Christians and Muslims manifest their obedience to the Creator, who wishes all people to live in the dignity that he has bestowed upon them. Dear friends, I pray with my whole heart that the merciful God will guide our steps along the paths of an ever more authentic mutual understanding. At this time when for Muslims the spiritual journey of the month of Ramadan is beginning, I address to all of them my cordial good wishes, praying that the Almighty may grant them serene and peaceful lives. May the God of peace fill you with the abundance of his blessings, together with the communities that you represent. Pray, Hope and Don't Worry! 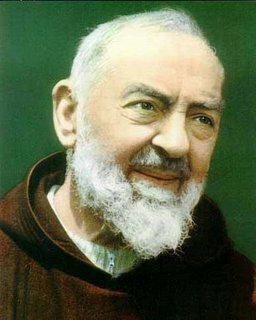 Today is the feast day of St. Pio of Pietrelcina. View more photos of St. Pio here. Click here for A Padre Pio Celebration. It's time to defend the Pope! If non-Catholics are doing it, why aren't we? 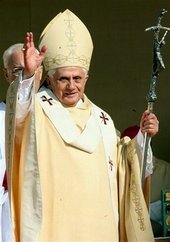 A Muslim's defense of the Pope: "The words of Pope Benedict should not be examined with scorn but with scrutiny. The respect that our Islam commands in the world today is diminishing because we have come to accept Wahhabi Jihad as normal behavior; this explains President Bush's message that abandoning us to ruthless dictatorships is breeding the divide all of us should fear. 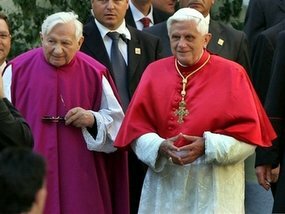 If Pope Benedict infringed upon us with his words, it is because Wahhabism has infringed and continues to infringe upon his world with brutality. Unless moderate Muslims control their destiny, Islam is in danger and its lifespan in the Arab world mirrors the lifespan of oil in Saudi Arabia." George Bush: "And, to the sense the pope clarified the issue, I think it helps those of us who are trying to make it clear to the Muslim world in particular -- we're not fighting Islam,"
Angela Merkel: "Whoever criticizes the Pope misunderstood the aim of his speech," Merkel was quoted as saying. It was an invitation to dialogue between religions and the Pope expressedly spoke in favor of this dialogue ... What Benedict XVI emphasized was a decisive and uncompromising renunciation of all forms of violence in the name of religion." 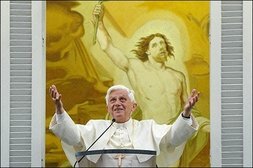 An Athiest's defense for Benedict: "In an era dominated by relativism and political correctness, where all religions are supposedly equal and truth is a matter of opinion (usually someone else's), it is refreshing to see someone uphold what they believe and defend it against all comers." Let us pray that more bishops and priests continuously defend the Holy Father. Click here to listen to Fr. Joseph Fessio's interview with Hugh Hewitt (Via Curt Jester). Defend the Vicar of Christ! This morning, Benedict addressed some newly ordained bishops at Castel Gandolfo. He instructed them to be steeped in prayer life and avoid excessive activism. "...each of you, in the daily nurture of your flock, must become 'all things to all men,' presenting the truth of faith, celebrating the sacraments of our sanctification and bearing witness to the Lord's charity. Welcome with an open heart those who knock at your door, advise them, console them and support them on the way of God." "Serenity in relationships, delicacy in dealings with others and simplicity of life are gifts that without doubt enrich the human personality of a bishop. ... The total giving of self, which the care of the Lord's flock requires, needs the support of an intense spiritual life nourished by assiduous individual and community prayer." Here's a wonderful story about the Holy Father when he was Cardinal relayed by his former housekeeper, Sr. Agapita. A hat tip to Father Stephanos, OSB. wonderful sense of humour and we laughed a lot together." I encourage you to read the entire story from Independent Catholic. Update: I heard SFO MOM played this game before!. I wish today to turn my thoughts back to various moments of my pastoral voyage to Bavaria, which thw Lord allowed me to fulfill last week. In sharing with you the emotions and sentiments that I felt revisiting the places that are dear to me, I feel above all that I must thank God for having allowed me this second visit to my country and my first to Bavaria, the land of my origin. I am sincerely grateful to all - bishops, priests, pastoral workers, public authorities, organizers and volunteers - who worked with dedication and patience so that each event could take place in the best possible way. As I said at my arrival in Munich on Saturday, September 9, the purpose of my visit was, in remembering how much my homeland contributed to my personality, to reaffirm and confirm, as the Successor to Peter, the close bonds that unite the Holy See and the Church in Germany. The trip was therefore not a simple return to the past but a providential occasion to look at the future with hope. "He who believes is not alone", the motto for the visit, came to mean an invitation to reflect on how every baptized person belongs to the only Church of Christ, within which one is never alone but in constant communion with God and all our brothers. The first stage of my trip was the city of Munich, also called the 'city with a heart' (Weltstadt mit Herz). In its historic center is the Marienplatz, Mary's Square, with Mary's column, crowned on top with a bronze statue of the Madonna. with a prayer to Mary. I returned there at the end of my tenure as Archbishop, before leaving for Rome. not only for Munich and Bavaria, but for all the Church and the whole world. The next day, Sunday, I celebrated the Holy Mass in the open area adjoining Munich's New Fair grounds among the faithful who came from various parts of Germany. On the basis of the Gospel text for that day, I reminded everyone that there is a 'deafness to God' from which we suffer particularly today. 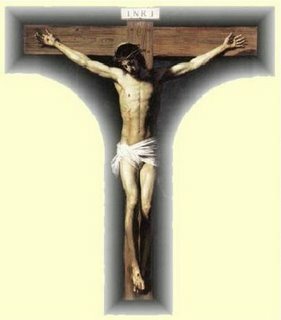 It is our task as Christians in a secularized world to proclaim and be witness to the message of hope that our faith offers us: in the crucified Jesus, God the merciful Father calls on us to be His sons and to overcome every form of hate and violence in order to contribute to the definitive victory of love. Together we celebrated Vespers at the famous Liebfraauendom, the Cathedral of our Beloved Lady, which houses the relics of St. Benno, patron of Munich, and where I was ordained a bishop in 1977. I reminded both children and adults, that God is not far form us, in some unreachable part of teh universe. That, on the contrary, through Jesus, He came to us to establish with each of us a friendship. Every Christian community, and the parish in particular, thanks to the constant commitment of its members, is called on to be a great family able to walk together along the path of true life. Monday, September 11, was spent mostly in Altoetting, diocese of Passau. This little city is known as Herz Bayerns, the heart of Bavaria, where the Black Madonna is venerated at the Gnadenkapelle (Chapel of Mercy), the object of numerous pilgrimages from Germany and central Europe. Near it is the Capuchin convent of St. Anne, where St. Konrad Birndorfer lived. He was canonized in 1934 by my venerated predecessor Pius XI. With the many faithful who attended Holy Mass at the Square in front of the Shrine to Our Lady, we reflected on the role of Mary in the work of salvation, so e may learn from her the lesson of goodness through service, and the humility and generous acceptance of divine will. Mary leads us to Jesus. This truth was made even more visible after the divine Sacrifice, in the procession with which, carrying the statue of the Medonna, we proceeded to the new Ambetungskappelle (Chapel of Adoration), inaugurated on this occasion. The following day, in Regensburg, whose diocese was established by St. Boniface in 739 and has as its patron anotther Bavarian saint, Bishop Wolfgang, there were three important events. In the morning, at the mass in Islinger Field, we reflected once more on the theme of the visit, on the symbol of the faith. God who is our Father wishes to gather together, through Jesus Christ, all of mankind in one family, the Church. That is why he who believes is never alone. He who believes need not fear coming to a dead end from which there is no way out. In the afternoon, I was at the Cathedral of Regensbirg, famous for its boys' choir, the Domspatzen (sparrows of the Cathedral) which has more than a thousand years of history and was under the direction of my brother Georg for more than 30 years. There, we held Ecumenical Vespers, with the participation of many representatives from the different churches and ecclesiastical communities of Bavaria and the members of the Ecumenical Commission of the German bishops conference. It was a providential occasion to pray together for the day to come nearer for full unity among all the disciples of Christ, and to reiterate our obligation to proclaim our faith in Jesus Christ without diminution, but in an integral and clear manner, above all, by our own behavior in showing sincere love. An experience that was particularly beautiful for me that day was to deliver the opening lecture of the academic year before an audience of professors and students at the University of Regensburg, where I taught as a profesor for several years. It was with joy that I found myself once more in the university world, which for a long period of my life, had been my spiritual homeland. I chose as my theme the relationship between faith and reason. To introduce the audience to the drama and the actual relevance of this issue, I quoted some words from a dialog between a Christian and a Muslim in the 15th century. In it, the Byzantine emperor Manuel II Paleologos - in a manner that for us was incomprehensibly blunt - presented to his Muslim interlocutor the problem of the relation between religion and violence. The quotation, unfortunately, lent itself to being misunderstood. For the attentive reader of my text, however, it would be clear that I never inteded to make mine the words pronounced by the medieval emperor in that dialog, and that its polemical content is not my personal conviction. My intention was altogether different. Tking off from what Manuel II himself said subsequently in a positive way, with a beautiful sentence about the rationality that should guide the transmission of faith, I wished to show that not religion and violence, but religion and reason, go together. The topic of my lecture, corresponding to the mission of a university, was therefore the relation between faith and reason. I wished to invite a dialog of the Christian faith with the modern world and a dialog among all cutlrues and religions. I hope that in various occasions during my visit - for instance, in Monaco, where I underscored how important it is to respect what is sacred to others - had made clear my profound respect for the great religions, particularly that of Muslims, who "adore the one God" and with whom we are committed to "defend and promote together, for all men, social justice, moral values, peace and freedom. (Nostro Aetate, 3). I trust therefore that after the initial reactions, my words at the Unviersity of Regensburg could constitute an impulse and an encouragement for a positive dialog, even self-critical, among religions as well as beween modern reason and the faith of Christians. The following morning, Wednesday, September 13, I presided over a brief liturgy to inaugurate a new organ in the Alte Kapelle (Old Chapel) of Regensburg, which houses a miraculous image of the Virgin painted, according to tradition, by St. Luke himself. Taking note of the structure of an organ which is formed out of tubes of different diameters - but all well harmonized, I recalled the need for all the bishops and all who work together in the ecclesiastical community, to converge, under the guidance of the Holy Spirit, for the single harmony in praise of God and of love for our fellowmen. The last stage, Thursday, September 14, was in the city of Freising, to which I feel particularly linked because I weas ordained a priest right in the Cathedral of Freising, dedicated to the Most Holy Mary and to St. Corbinian, the evangelist of Bavaria. In the Cathedral I had my last scheduled meeting, that with the priests and permanent deacons of the diocese. Reliving the emotions of my own ordination, I reminded my fellow priests of the duty to work with God to inspire more vocations, and called on them to develop an i,ner life as a pastoral priority so as never to lose touch with Christ, the source of joy in the daily efforts of ministry. In the departure ceremony, thanking once more all who had worked to make the visit possible, I reaffirmed its ultimate purpose: to bring the attention of my fellow Bavarians once more to the eternal truths of the Gospel and confirm among the faithful their adherence to Christ, Son of God incarnate, who died and resurrected for us. May Mary, Mother of the Church, help us to open our hearts and minds to Him who is "the Way, the Truth and the Life" (Jn 14,16). For this I prayed, and for this I invite all of you, dear brothers and sisters, to continue to pray, as I thank you from the heart for the affection with which you accompany me daily in my ministry. I thank you all. Today I wish to share some recollections of my pastoral visit to Bavaria. More than a journey to my roots, it was an opportunity to look forward with hope. Under the motto "those who believe are never alone" I invited all to reflect on the baptized person’s membership in the Church where, never alone, one is in constant communion with God and others. In Munich’s central square, I implored the Virgin’s blessing upon the whole world. The following day I spoke of a certain difficulty in hearing God in a secular world which needs so much the Gospel’s message of hope. At Altötting we reflected on Mary’s generosity in accepting God’s will, recalling how she guides us towards Jesus. Returning to the theme of the visit, I noted in Regensburg that the Father wishes to gather all humanity into one family, the Church. Here, at the University where for many years I had taught, I spoke on the relationship between faith and reason. I included a quotation on the relationship between religion and violence. This quotation, unfortunately, lent itself to possible misunderstanding. In no way did I wish to make my own the words of the medieval emperor. I wished to explain that not religion and violence, but religion and reason, go together. I hope that my profound respect for world religions and for Muslims, who "worship the one God" and with whom we "promote peace, liberty, social justice and moral values for the benefit of all humanity" (Nostra Aetate, 3), is clear. Let us continue the dialogue both between religions and between modern reason and the Christian faith! I warmly welcome all the English-speaking pilgrims present today. In particular, I greet the members of the Society of Missionaries of Africa and the pilgrims from Samoa. Upon you all, I invoke God’s abundant blessings. From Papa Ratzi Forum and Papacy and the Vatican. 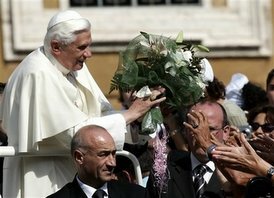 I was made aware through Pope Benedict XVI Blog of a spiritual bouquet being offered for our Holy Father. Let us commit to saying prayers for him. 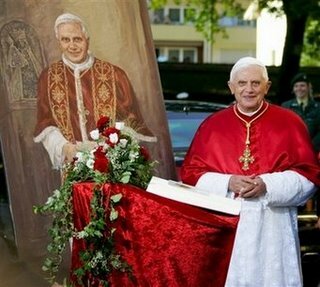 Some Reflections on Pope Benedict XVI's Address at the University of Regensburg by Fr. Joseph Fessio, S.J. 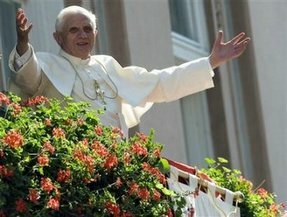 Both before and since his elevation to the papacy, Benedict has taken a consistent approach to controversial issues: he locates the assumptions and fundamental principles underlying the controversy, analyzes their "inner" structure or dynamism, and lays out the consequences of the principles. More in Is Dialogue with Islam Possible? Kenneth Kully has created a banner of courage for the Holy Father. Hat tips to Dymphna's Wells and Moneybags. Place on top of your blog or sidebar. You don't have to link to me, just spread the word! Let us support the Holy Father for he bears much courage, humility and strength. Viva Il Papa! Here are some great insights by Fr. John T. Zuhlsdorf that I encourage you to read. In the meantime, let us stand by the Holy Father for he has approached this with courage and humility, offering him our Rosaries. Viva Il Papa! Here is a translation of the words of the Holy Father at the Angelus today in Castel Gandolfo. The first part relating to his Bavarian visit and the Regensburg lecture if the official translation provided by the Vatican Press Office. The Pastoral Visit which I recently made to Bavaria was a deep spiritual experience, bringing together personal memories linked to places well known to me and pastoral initiatives towards an effective proclamation of the Gospel for today. I thank God for the interior joy which he made possible, and I am also grateful to all those who worked hard for the success of this Pastoral Visit. As is the custom, I will speak more of this during next Wednesday’s General Audience. Yesterday, the Cardinal Secretary of State published a statement in this regard in which he explained the true meaning of my words. I hope that this serves to appease hearts and to clarify the true meaning of my address, which in its totality was and is an invitation to frank and sincere dialogue, with great mutual respect. Now, before the Marian prayer, I would like to dwell on two recent and important liturgical commemorations: the Feast of the Exaltation of the Holy Cross, celebrated on September 14, and that of Our Lady of Sorrows, celebrated the day after. These two liturgical celebrations my be summarized visually in the traditional image of the Crucifixion, which represents the Virgin Mary at the foot of the Cross, according to the description of the Apostle John, the only one of the Apostles who stayed near the dying Jesus. But what sense is there to exalt the Cross? Is it not perhaps scandalous to venerate an infamous punishment? The Apostle Paul says: "We preach Jesus crucified - this is scandalous to the Jews, stupid to the pagans." (1 Cor 1,23). But Christians do not exalt just any cross, but that Cross which Jesus sanctified with His sacrifice, fruit and testimony of immense love. Christ on the Cross shed all his blood to liberate humanity from the slavery of sin and of death. Therefore, from being a sign of damnation, the Cross has been transformed into a sign of blessing, from a symbol of death to the symbol par excellence of Love which triumphs over hate and violence and generates immortal life. "O Crux, ave spes unica! O Cross, the only hope!" - so the liturgy sings. The evangelist narrates: at the foot of the Cross was Mary (cfr Jn 19, 25-27). Her sorrow is one with that of her Son. It is a sorrow full of faith and love. The Virgin on Calvary participates in the saving power of Christ's pain, uniting her 'fiat' -Thye will be done - with that of Her Son. 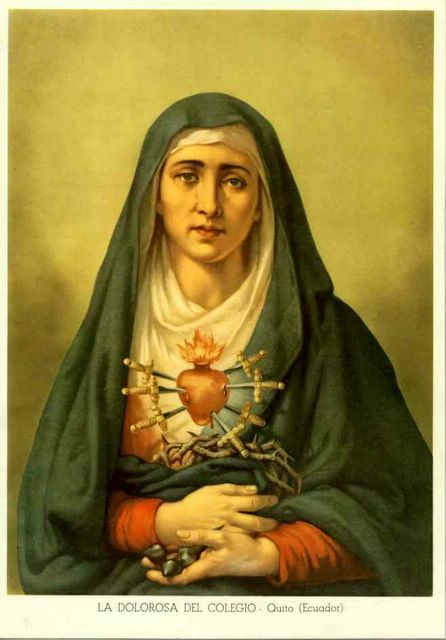 Dear brothers and sisters, united spiritually with Our Lady of Sorrows, let us renew our own Yes to God who chose the way of the Cross to save us. This is a great mystery which is ongoing, to the end of the world, and which also requires our participation. May Mary help us to take up our Cross daily and follow Jesus faithfully along the way of obedience, sacrifice and love. I greet all the English-speaking pilgrims and visitors present at today’s Angelus, and I thank you for your prayers during my pastoral visit to Bavaria. May your stay here in Castel Gandolfo and Rome be a time of spiritual enrichment, marked by the readiness to take up the cross and follow Jesus. Upon you and your loved ones, I invoke the grace and peace of Christ the Lord! Eighteen months into his papacy, the Pope has shown the brilliance of his mind, the tenderness of his heart and the strength of his character to the world who knew little about his real person. The man who has been chosen by God to be His Vicar seems to have the whole world constantly watching and following his every move. 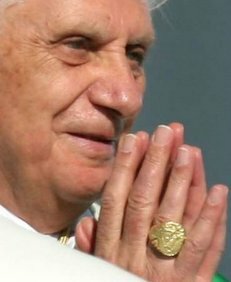 The benevolent Pope knows, with intimacy, the good God who has entrusted him with the care of the Holy Roman Catholic Church. He listens well to the Eternal Word and he is not afraid to proclaim It. As priest and Supreme Pontiff, he is sustained at every moment by Jesus the Word Made Flesh. He knows too well, from his childhood experiences that the rejection of God wreaks anarchy and comes from a source that is evil. And so his very words, his actions and his entire life are based on the Truth. He cooperates with It and defends It with his life. To proclaim the Truth is the road that eventually leads to martyrdom. This is the road that all the saints have chosen. 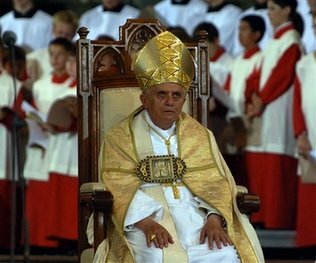 Pope Benedict was born to tread this road. 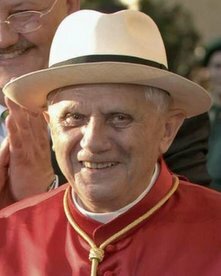 The red papal vestments that he has worn symbolize his willingness for martyrdom - the red robes, shoes and hats are profound symbols. Furthermore, his words mean what they say and they say what they mean. Even when he was Cardinal Prefect, he was criticized for being a “hardliner”. Only when one obeys God’s commandments, lives them and is not afraid to teach them is one labeled as such. Yet, those who are not of the Catholic faith seem to be drawn to the authority of his words because their hearts are attracted to the Holy Spirit Who inspires him. 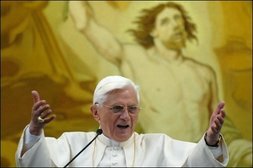 Benedict’s role is to unite all people in the truth. But what does it take to unite? He must proclaim the Truth with the firm hand of a father and the tender heart of a mother. The Truth will first divide the goats and the sheep and unite the faithful into one sheepfold. The Holy Father untiringly speaks of the truth and his words seem to be effective at this hour when he challenges not only the Islamic extremists but also the whole world with the Truth Who Is Jesus, with Faith that has Reason and with God Who Is Love. And so “Be not afraid!” because in everything, God Triumphs in His Cross! 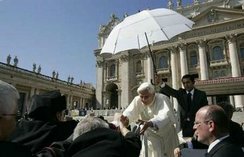 Pope Benedict is not afraid. Let us be children of the Holy Father and offer today our Rosary for him, asking Our Lady of Sorrows to continue to guide and protect him. Meanwhile, we pray for a peaceful reconciliation with our Muslim brothers and sisters who have misunderstood the core message of his address. The Holy Father speaks in truth and those who interpret just a small section of his address is missing the point. Domenico Bettinelli explains more here and here. 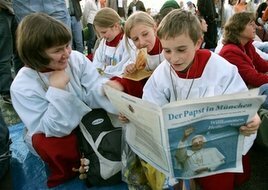 Read the papal address at the University of Regensburg "Three Stages in the Program of De-Hellenization". Regarding the reaction of Muslims to the Pope's address, the Vatican says the message was not meant to offend the Muslim community. "It was certainly not the intention of the Holy Father to undertake a comprehensive study of the jihad and of Muslim ideas on the subject, still less to offend the sensibilities of Muslim faithful. "What is clear then, is the Holy Father's desire to cultivate an attitude of respect and dialogue towards other religions and cultures, including, of course, Islam." From Catholic Culture. Read The Dolours of Mary by St. Alphonsus Ligouri. 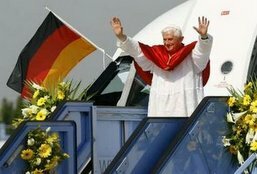 Pope Benedict XVI bids farewell after a six-day nostalgic apostolic journey to his homeland from the Munich international airport September 14, 2006. He came not only to visit his homeland but to do what he can to inspire and plant the seeds of faith in a country where secularization is so strong. In one of his messages to priests, he said "There is so much to be done, I see that I can't do it," he told a group of priests. That is true for priests, I can guess to what extent. 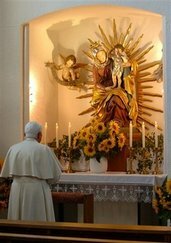 That is also true for the Pope: he has so much to do and my strength is not sufficient for it all. So I must learn to do what I can and to leave the rest to God and my colleagues. There are fewer workers. 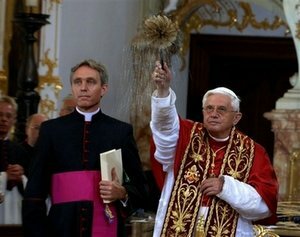 Ask God that he sends workers," Benedict said. We adore thee, O Christ, and we bless thee, for by thy cross thou hast redeemed the world. For God so loved the world that He gave His only begotten son, that whosoever believeth in Him may not perish, but have everlasting life. "Consummatum est." It is completed -- it has come to a full end. The mystery of God's love toward us is acomplished. The price is paid, and we are redeemed. The Eternal Father determined not to pardon us without a price, in order to show us especial favor. He condescended to make us valuable to Him. What we buy we put a value on. He might have saved us without a price --- by the mere fiat of His will. But to show His love for us He took a price, which, if there was to be a price set upon us at all, if there was any ransom at all to be taken for the guilt of our sins, could be nothing short of the death of His Son in our nature. O my God and Father, Thou hast valued us so much as to pay the highest of all possible prices for our sinful souls -- and shall we not love and choose Thee above all things as the one necessary and one only good? From here. Image from here. 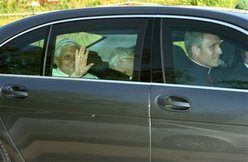 Pope Benedict XVI waves to his neighbours as he visits the house he has kept in Pentling, just outside Regensburg, southern Germany, Wednesday, Sept 13, 2006. 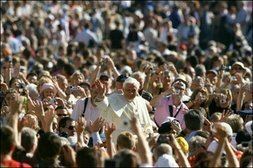 The pontiff is on six-day visit to his native Bavaria. 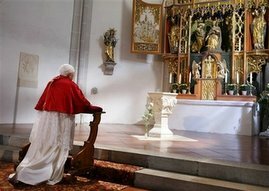 Pope Benedict XVI prays in front of the altar of the St. Josef Church in Pentling just out of Regensburg, southern Germany, Wednesday Sept. 13, 2006. 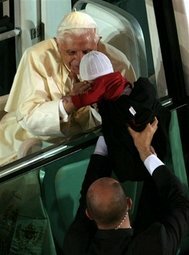 Pope Benedict XVI, left, caresses a child as he welcomed by his neighbours during a visit of the house he has kept in Pentling, just outside Regensburg, southern Germany, Wednesday, Sept 13, 2006. To scientists at the University of Regensburg, where he was a professor and vice rector from 1969 to 1971. Speaking to an audience of scientists and scholars, at the university where he himself once taught theology, the Holy Father argued that Christianity welcomes intellectual inquiry and always reveres the truth. The academic world, he said, should not be bound by a fear of addressing in turn that question raised by faith. The Pope opened his lecture by quoting a scholarly work of the Byzantine Emperor Manuel II Paleologus, writing late in the 14th century, about the difference between the Christian and Islamic understanding of God. 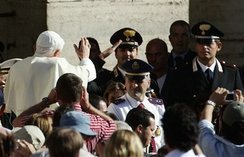 Tracing the emperor's argument on the use of force and the concept of "holy war," the Pope pointedly quoted from the Qu'ran (surah 2, 256): "There is no compulsion in religion." From the Christian perspective, the Pontiff continued, any attempt to use religious faith as justification for violent attacks is impossible. "Violence is is incompatible with the nature of God and the nature of the soul," he said. 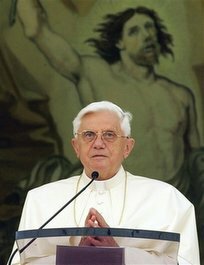 At a September 13 service dedicating a new organ for the Alte Kapelle (Old Chapel) in Regensburg, Pope Benedict XVI used the image of musical harmony to warn against "false notes" of dissidence within the Church. The Holy Father, a gifted amateur pianist with a great love for classical music, obviously enjoyed the event, which included a performance of a Bach toccata and fugue on the new organ. He was accompanied-- as he has been on most public appearances in Bavaria-- by his brother, Msgr. Georg Ratzinger, the retired director of the Regensburg cathedral choir. The Pope noted Regensburg's worldwide reputation as "a center for the reform of sacred music." 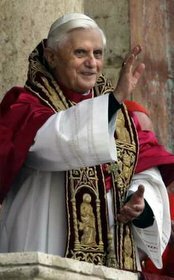 He stressed the importance of that work, citing the teachings of Vatican II, saying that "music and song are more than an embellishment of worship; they are themselves part of the liturgical action." The organ, the Pope continued, is known as "the king of musical instruments," because of the variety of sounds it creates, giving "resonance to the fullness of human sentiments." "In the organ, the many pipes and voices must form a unity," the Pontiff said. If some pipes are blocked or damaged, the sound becomes distorted; the same is true if weather conditions affect the instrument. "Now this is an image of our community," he said. "Just as in an organ an expert hand must constantly bring disharmony back to consonance, so we in the Church, in the variety of our gifts and charisms, always need to find anew, through our communion in faith, harmony in the praise of God and in fraternal love." "Under the watchful gaze of Saint Anne, in whose home the greatest vocation in the history of salvation developed," that of the Virgin Mary, the Holy Father invited those present to reflect upon "our vocation to serve Jesus Christ." 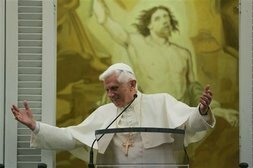 "God's harvest is indeed great, and it needs laborers," said Pope Benedict, "in the so-called Third World - in Latin America, in Africa and in Asia - people are waiting for heralds to bring them the Gospel of peace, the good news of God Who became man. But also in the so-called West, here among us in Germany, and in the vast lands of Russia it is true that a great harvest could be reaped. But there is a lack of people willing to become laborers for God's harvest." "Lord, ... look upon our world and send us laborers!" cried the Pope. "With this petition we knock on God's door; but with the same petition the Lord is also knocking on the doors of our own heart. Lord do you want me? Is it not perhaps too big for me? Am I too small for this? 'Do not be afraid,' the Angel said to Mary. 'Do not fear: I have called you by name,' God says through the Prophet Isaiah." 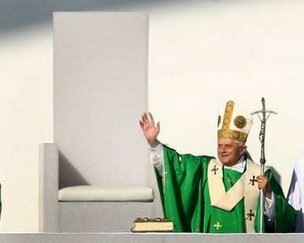 One thing about the Holy Father is that he looks good in hats. This one was a gift to him during his visit to his birthplace. In his address to seminarians he says, ""Faith is simple. We believe in God. ... We believe in a God Who enters into a relationship with us human beings, who is our origin and future. Consequently, faith is, always and inseparably, hope: the certainty that we have a future and will not end up as nothing. And faith is love, since God's love is 'contagious.' ... The Creed is not a collection of propositions; it is not a theory. ... Truly, those who believe are never alone. God comes to meet us." More here. REGENSBURG, Germany (AFP) - Pope Benedict XVI will hold the final open-air mass of a six-day visit to his homeland, when tens of thousands of pilgrims are expected to greet him in a park near this Bavarian town. 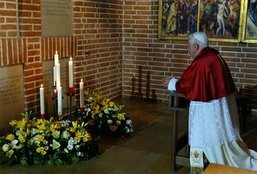 The 79-year-old pontiff will celebrate mass at Islinger Feld outside Regensburg at 10:00 am (0800 GMT), before meeting scientists and academics at the local university and holding a ecumenical prayer service in the city's cathedral. Some 250,000 pilgrims attended the first mass of his visit in central Munich on Sunday, and a further 60,000 gathered for a second mass in the small town square of Altoetting on Monday. Benedict was later Monday given a hero's welcome when he paid a brief visit to Marktl-am-Inn, the small Bavarian market town where he was born. He was greeted by a brass band and loud cheers from the crowd as he stepped from his limousine on the latest stop on the nostalgic six-day tour of his native region of southern Germany. 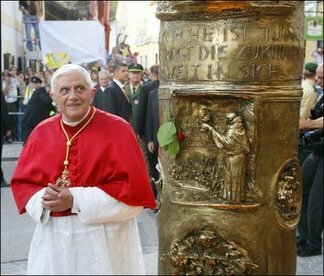 Wellwishers in the town situated 100 kilometres (60 miles) from Munich craned their necks to catch a glimpse of the former Joseph Ratzinger, whose father Joseph senior was the local policeman. The pope spent a few minutes praying in the Church of St Oswald, where he was christened on the day he was born, April 16, 1927. 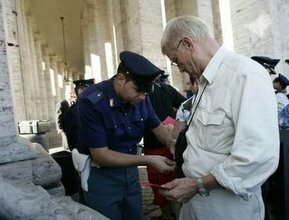 He knelt briefly at the baptismal font, accompanied by his 82-year-old brother Georg, a retired priest, before climbing into the popemobile to be driven through the town. Although he got out of the car in front of the two-storey house where he spent the first two years of his life, he did not approach the building. Instead, he paused to admire an engraved bronze column featuring scenes of his life which was erected opposite the house this month in time for his visit. The house has been extensively renovated for the event, but the pope has said he has no memories of living there. His father's job took the family to the nearby town of Tittmoning when he was two years old. 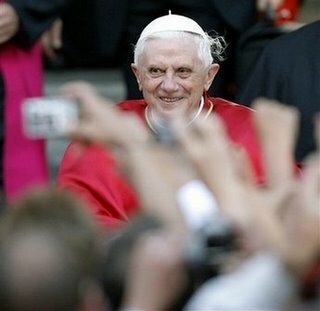 Benedict was returning to his birthplace for the first time since he was elected pope in April last year. 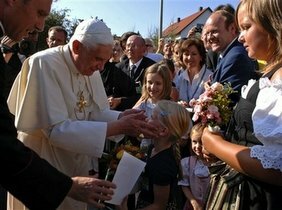 The Marktl visit was the culmination of a day when the pope left behind the cosmopolitan surroundings of Munich to return to the rural Bavaria where he grew up. After the open-air mass in Altoetting's Kapellplatz square, the head of the Roman Catholic Church addressed seminarians in the local basilica and appealed for new vocations to the priesthood. 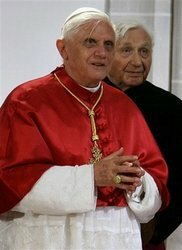 The pontiff is making his fourth foreign trip in the 17 months since becoming pope and the second to Germany. He has also visited Poland and Spain. "I promise to inquire with the Carmelites ten years from now." 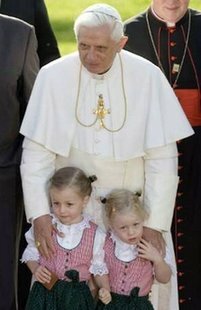 Two Bavarian children pose with the Pope. 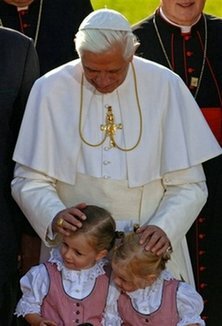 It looks like the little one on the left got a little brown pouch from Papa... a Rosary blessed by the Pope. Today we remember all those who perished in the September 11 terrorist attack five years ago. Let us pray for the repose of their souls and for the families they left behind. Eternal rest grant unto them O Lord and let perpetual light shine upon them. May they rest in peace. Amen. 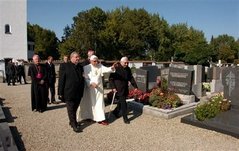 Sep. 11 (CWNews.com) - Pope Benedict XVI and the faithful of Bavaria joined in prayer for the victims of terrorism on September 11, recalling particularly the attack on New York five years earlier. 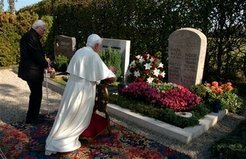 As the Pope celebrated Mass at the Marian shrine in Altötting, one of the prayers of intercession referred directly to the somber anniversary: "Five years after the attacks on New York, we pray for the victims, and for peace in the entire world." 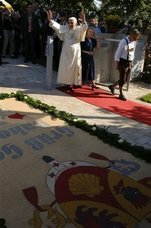 The previous day, when the Pope celebrated Mass in a fairground in Munich, one of the prayers of the faithful had sounded a similar theme, with a petition for the victims of warfare, terror, and violence, and for the political leaders seeking to provide security and justice for their peoples. "Dear parents! I want to heartily invite you to help your children believe and to accompany them on the way to Communion, which continues on after First Communion, on their wayt to Jesus and with Jesus. Please, go to church with your children for the Sunday Eucharist. You will see: This is no wasted time, that holds the family together properly and gives it a focus. The Sunday becomes more beautiful, the whole week becomes more beautiful, if you attend God's service (Mass) together. And please, also pray together at home: at meals, before going to sleep. Praying not only leads us to God but also to one another. It is a force of peace and of joy. Life within the family becomes more special and of greater importance when God is there and His presence is experienced, lived in prayer. Dear religious education teachers and educators! I ask you with all my heart to keep present the question about God, about the God that showed Himself to us in Jesus Christ in your schools. I know that it is difficult to speak of the faith in school in our pluralistic world.But, it is not sufficient when children and young people only learn abilities and technical know-how in school, but learn no (moral) standards that give meaning and direction to ability. Encourage the students to not only ask about this or that, that is fine, but to above all ask about the Where from and the Where to of our life. Help them to recognize that all answers that do not reach all the way to God fall short. Dear pastors and all who help in parishes! I ask you to do everything so that a parish can become an internal home for the people - a big family, in which we at the same time experience the even bigger family of the worldwide Church - through the Eucharist, the catechesis and through all manners of parish life learn to walk the way of true life together.All three locations - family, school, parish - belong togethre and help us to find the sources, the wellsprings of life - and, dear children, dear parents and dear educators, after all, we all want to have 'life in full'. Amen." “It is very moving for me to stand once more in this beautiful square at the foot of the Mariensäule – in a place which already witnessed two other decisive turning-points in my life." “From my childhood, I was very much taken with the story that a bear had attacked and killed the horse which the saint was riding on a journey to Rome. According to the legend, the saint punished the bear by putting on his back the load that the horse had been carrying. So the bear had to carry this load across the Alps all the way to Rome, and only there did the saint set him free. ... I have found in Saint Corbinian’s bear a constant encouragement to carry out my ministry with confidence and joy – thirty years ago, and again now in my new task – and to say my daily ‘yes’ to God. I have become for you a beast of burden, but as such ‘I am always with you’ (Ps 73:23). ...although in my case, the beast was never set free." Munich, Sep. 10, 2006 (CNA) - Completing his first full day in Munich, Pope Benedict XVI prayed Vespers, or evening prayer, at the Cathedral of Munich. Among the participants were several children who are preparing for their First Communion, their families, and catechists of the archdiocese. Prior to entering the Frauenkirche (~the Church of the Lady) the Pope spent time speaking with the crowd gathered outside and shaking their hands. 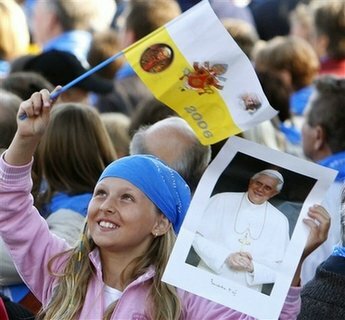 The faithful were overjoyed – smiling and offering prayers and encouragement to the Pope as he passed. An older Bavarian woman, at one point, grabbed the Pope’s arm and pulled him close for a hug. The Pontiff entered the gothic cathedral which, with the exception of its two onion-domed spires, was entirely rebuilt after being destroyed during World War II. Benedict processed down the main aisle of the cathedral and made a short visit to the Blessed Sacrament Chapel and the church’s crypt. 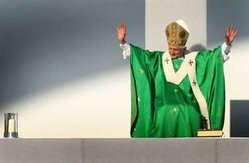 He emerged from the crypt in a green cope and mitre with his pontifical crosier in hand. After the powerful singing of the psalms and at the conclusion of the reading (Revelation 7), the Holy Father offered a brief reflection. This “tent of God” is a reference to the Gospel of John, which reads, “The Word became flesh and pitched his tent among us (Jn 1:14),” the Pope noted. 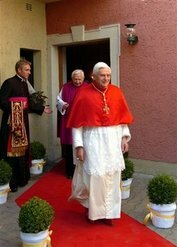 Munich, Sep. 10, 2006 (CNA) - Pope Benedict XVI celebrated the first public Mass of his trip to Bavaria this morning, telling his countrymen while Germany is admired for its scientific and technical prowess and even noted for its social concern for those in need, that it is lacking in faith. The Pope offered the Eucharistic sacrifice on a white and gray stage erected before a myriad of Germans who were gathered on Munich’s New Fairgrounds. The sparsely decorated sanctuary held at its apex a life-size crucifix, dating from the 9th century. 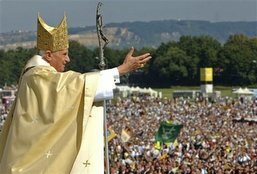 The assembled crowds, standing in groups upon the grassy fields, watched and listened to their countryman, now the head of the worldwide Roman Catholic Church. In his Homily the Holy Father challenged his fellow Germans to allow their ears to be opened to God’s word and to do away with the cynicism that is shutting God out of society. Read more here.